As the Center for Equity in Learning continues to advance ACT’s mission to help all people achieve education and workplace success, there are increasing numbers of opportunities to focus on social impact and making a difference. These opportunities span both existing relationships and initiatives new to ACT. In September, ACT joined more than 600 participants at Innovate + Educate’s annual Close It Summit in Chicago where we were this year’s Innovation Sponsor. ACT and Innovate+Educate have worked together for many years and share interest in innovation, access, and closing the employment opportunity gap. Our participation and sponsorship is important because there has been a long standing disconnect between K-12, postsecondary education, and the workforce that the Close It Summit bridges together. Connecting philanthropy, for-profit, nonprofit, government leaders, and other stakeholders is vital to creating a successful workforce ecosystem where all students can have equitable access. At this year’s conference, Chief Officer Jim Larimore and I contributed to expert panels that discussed increased opportunity, access, and success for underserved and working learners with an emphasis on the importance of social-emotional learning. Our presence was an interdepartmental collaboration as ACT continues to work closely with the education and workforce communities, including state and federal education leaders to promote equity in education and career opportunities for all, especially our underserved communities. In 2017, more and more women made the decision to run for office. 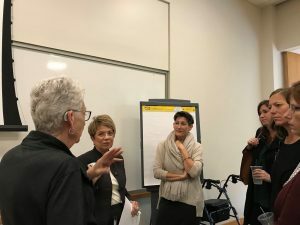 Earlier this year ACT’s Corporate Giving Committee funded the organization 50-50 in 2020 and their Blueprint for Winning Academy, which is a program to help women understand how to run a campaign and win. 50-50 in 2020 is a nonpartisan, nonprofit organization that seeks to increase the number of women running for local, state, and federal offices. With ACT’s Center for Equity in Learning support, 50-50 in 2020 convened a “lunch and learn” presentation for ACT team members. More than 60 people attended this event both in person and online. ACT COO Janet Godwin spoke from personal experience about her recent school board election success and why she ran for office. She wanted to bring her perspective and leadership skills to the school board to help the local public schools meet the needs of all of their students, including the underserved. Janet has a passion for getting things done and ensuring access and opportunity for all. 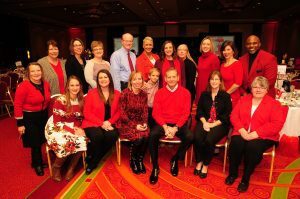 In 2017, the ACT Corporate Giving Committee again gave funds to the local American Heart Association (AHA) which included funds for the Johnson County Go Red for Women event on November 9 in Coralville, Iowa. ACT’s sponsorship included the keynote sponsorship and a booth to help share with community members more about ACT’s social impact efforts. The event raised $20,000 for the organizations efforts. Dollars raised fu nd research grants needed to help find a cure for heart disease, stroke, and other cardiovascular diseases. AHA tries to increase awareness, education, and prevention. Of women who die, one in 29 die of breast cancer. One in every three women die of heart disease, stroke, and other cardiovascular diseases. Rose Gooding Robinson was the keynote speaker and will also visit ACT’s campus on Feb. 14, 2018 for a heart-healthy presentation for all team members. Many ACT team members have been positively affected by the American Heart Association, so the sponsorship is also a great way to support team members who have faced challenges in their lives. Our social impact efforts include ACT’s corporate giving investments and the volunteer services that our team members bring to both individuals and organizations in need. These efforts help personalize ACT’s outreach into the communities where our team members live and work. We have aligned our philanthropic efforts to emphasize the core pillars of local education, human and social needs, cultural and artistic achievement, community benefit, and disaster relief. In 2017, ACT gave $120,000 to 72 organizations in six states and Washington, D.C. We are eagerly looking forward to making similar impact in 2018.